Let's jump right into Venom itself. I thought that the CGI for Venom was done well enough for the sake of this film. While it wasn't perfect, I thought it was a smart decision to mask the CGI in darker settings. Also, given the fact that Spider-Man could legally not be mentioned or involved in this movie, I thought this film did a good job of working around that. Venom's origin is still preserved as much as possible given the fact that it is an alien, but more importantly, it doesn't try to mimic or copy Spider-Man's abilities. I appreciated the fact that they allowed Venom to have his own set of abilities that are a bit more grounded and practical. Probably one of my favorite scenes are the San Francisco motorcycle chase scene. I think it's fair to say that Tom Hardy stepped into this role and delivered a satisfying performance. I think his best moments have to be when he interacts with the symbiote Venom. For those of you who didn't know, Hardy also voiced the alien Venom too. The relationship between Hardy's Eddie Brock character and Venom have some funny moments throughout the film. In a sense they almost have an Odd Couple type of relationship except Hardy's body is the place of residence. Well there's a lot to cover here so let's start with the biggest issue first. I think the main problem with Venom is the fact that it has very little consistency with the direction and tone. It's almost like the movie can't make up its mind as to whether it wants to be a horror, action flick or a slapstick comedy. I think a lot of this inconsistency comes in with what seemed like a lot of forced humor. At some points of the movie, you'd think you were watching a remake of Jim Carrey's the Mask or something. Don't get me wrong though. Some of the "crazy" moments between Brock and Venom are entertaining, but in regards to the movie as a whole, they simply didn't always gel very well. In my opinion, that falls on the shoulders of the director Ruben Fleischer. He was the director of Zombieland, and if you've seen that movie, then you can see a lot of similarities in Venom as well. Now let me go back to the comedy in this movie. I understand that everyone will have their own sense of humor when it comes to comedy, but I'm just of the belief that timing and frequency matters when it comes to humor. For Venom, I thought that one of the weaknesses of the comedy was that they had Venom, the symbiote, talk a little too much. Venom acted like the comic relief in this film rather than being that terrifying alien menace he's typically been portrayed as. Just think of like when you go see a stand up comedian, and they say a funny joke, but then they keep running the same joke into the ground. One thing that I also found troublesome was the character building in this movie. Eddie Brock's character felt rushed and under developed. I don't blame Tom Hardy for this at all, and instead I think this was more of a problem with the writing in this movie. Brock's character goes from being scared, to happy, to terrified, to mad, to whatever other emotional spectrum they wanted to randomly put him on. Basically, the problem is that his development didn't transition well given the many different situations he was put in. Brock isn't the only victim of the writing either; Venom is too. The symbiote goes through its own changes that also feel rushed and not properly earned. Overall the CGI in this film isn't terrible, except for when you get to the final act of the film. Unfortunately this film commits the same problem that the Michael Bay Transformers movies did time and time again. The main villain in the film essentially looks exactly like Venom except slightly grayer. Not to mention, the fact that most of the movie is done with a night time setting, which makes it even harder to make out who's who during some big fight scenes. One last thing, and I'll fully admit this is more of my own personal issue. I'm not a fan of the shift of direction in terms of the relationship that Brock has with the symbiote. For those of you familiar with the comic source material, we know that Brock and Venom bond through their hatred of Spider-Man. In this film, they take Brock and Venom's relationship down a different path. Just going off of what the film itself tries to setup with their relationship, it felt like I was watching some romantic comedy. That's not to imply that that there's anything sexual between Brock and Venom, but the way they act so buddy-buddy was just off given the character's traditional background. Again, since they can't use Spider-Man or any references to him, they replace that mutual bond with another commonality that Brock and Venom both share. Personally, I thought it was a cheap "Martha" moment, and I thought it was a pretty corny way to have these character connect. It was a very "lose-lose" situation. Venom is going to be a lot of different things for different people. When people ask me what was this movie like, there's a couple of different ways I'd like to describe it. In one sense, it reminds me of Blade 3. You have some things in the movie that are entertaining, and then you're hit some with corny stuff that are kinda cringe worthy. In another sense, if we were to about the feel of the movie, I'd say its closest comparison has to be Suicide Squad. Take however you felt about Suicide Squad, and that's Venom. I used that as a comparison mainly because Suicide Squad was supposed to, and felt like it should've been rated R. However, both Suicide Squad and Venom pulled their punches and it's very noticeable. Also, both movies felt some unnecessary pressure to make their movies have that good ol' "Marvel fun" and forced comedy into the film when it wasn't necessary at all. Now in terms of how this movie looks and works, I'd probably have to say that this film is a perfect combination of the movie Upgrade, Life, and a little bit of The Incredible Hulk. If you've seen Upgrade, then you've already seen 70% of Venom. Especially since Logan Marshall Green looks exactly like Tom Hardy. I know the other question on many people's mind is whether or not this was better or worse than Spider-Man 3. I'll say that this version of Venom was way better than the Venom we saw in Spider-Man 3. I'll also say that Venom was a better movie than Spider-Man 3 too. But just keep in mind that that's a low bar. I've said it before, and I'll say it again. Venom is not trash. It's not comparable to the most recent Fantastic Four or Catwoman as some have said on the internet. It does have a lot of problems, but even despite all that, there's still something there that can be appreciated in the film. There's still some entertainment that some people will enjoy. So with that, I recommend watching this more so as a matinee watch, and go in with low expectations too. By the way there are two post credit scenes so be sure to stay to the very end. I think I'd have to say that the last post credit scene was the best part of Venom, mainly because it had nothing to do with Venom. 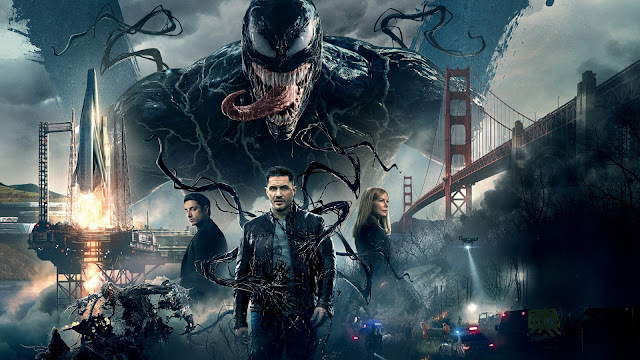 Are you excited to go see Venom? Let me know what you think about the movie when you get a chance to see it later. If enough people want to talk about it, maybe we can do a live video chat about it, and get into spoilers too. I'll see if I can get around to doing that maybe around this Sunday. Anyway let me know your thoughts on Venom in the comments below. I've got more reviews and videos to do for you all and until next time ill see you guys later.